The DOT is offering $22.5 million in grants in the latest round of its Low or No Emission Vehicle Deployment Program (LoNo). Funds will be awarded on a competitive basis to transit agencies and state transportation departments working either independently or jointly with bus manufacturers. The LoNo program is focused on deploying new low- or no-emission production buses that are market-ready or near market-ready (not in development or prototype stages). It gives priority to the buses with the lowest energy consumption and emissions. The previous round of LoNo funding, announced in February 2015, awarded $55 million in grants to ten US organizations. All buses proposed for deployment must complete the Federal Transit Administration’s bus testing program, and follow FTA Buy America regulations. Priority will be given to tested zero-emission bus models with proven effectiveness (such as Proterra and BYD models already in service in several US cities). The U.S. Department of Energy (DOE) has awarded more than $20 million in 10 projects to advance fuel cell and hydrogen technologies and enable early adoption of fuel cell applications, such as light-duty fuel cell electric vehicles (FCEVs). "These projects announced today will continue to make advances in our rapidly expanding portfolio of hydrogen and fuel cell technologies," says Assistant Secretary for Energy Efficiency and Renewable Energy David Danielson. "Energy Department-supported projects have helped reduce the modeled cost of transportation fuel cells by 50 percent since 2006, and more than double durability and reduce the amount of platinum necessary by a factor of five." The DOE says the hydrogen and fuel cell market continues to grow rapidly. According to the department’s newly released 2014 Fuel Cell Technologies Market Report, the industry grew by almost $1 billion in 2014, reaching $2.2 billion in sales - up from $1.3 billion in 2013. In addition, more than 50,000 fuel cells were shipped worldwide in 2014. To further develop and advance these clean energy technologies, the DOE has selected seven projects to address the hydrogen and fuel cells research and development area, including hydrogen production via microbial biomass conversion, low platinum group metal catalyst development for fuel cell applications, development of integrated intelligent hydrogen dispensers, and hydrogen delivery pipeline manufacturing. Three projects were selected to address early market and demonstration. These include the demonstration of mobile hydrogen refueling technology to address the lack of widespread hydrogen fueling stations, as well as fuel-cell-powered range extenders for light-duty hybrid electric vehicles. In addition, the DOE notes the City of Ithaca, N.Y., has proposed to become home to one of the first commercial hydrogen-electrolyzer fueling stations in the northeastern U.S. and to ramp up outreach through the use of FCEVs. The U.S. Environmental Protection Agency (EPA) is announcing the availability of approximately $7 million in funding for rebates to public and private school bus fleet owners for the replacement and retrofit of older school buses. Replacing these buses that have older engines will reduce diesel emissions and improve air quality. New to this year’s program is the option of implementing retrofit technologies. Fleet owners can install Diesel Oxidation Catalysts (DOC) plus Closed Crankcase Ventilation (CCV) systems to reduce emissions by up to 25 percent, and they can replace older buses with newer ones that meet the latest on-highway emission standards as in previous EPA rebate programs. EPA will pay up to $3,000 for each DOC plus CCV, and between $15,000 and $25,000 per replacement bus, depending on the size. Applicants may request up to 10 buses for replacement and up to 10 buses for the retrofit option on each application. Fleets with more than 101 buses currently in operation may submit two applications. EPA will accept applications from September 28 to October 30, 2015. Boston Public Schools will operate 11 percent of its bus fleet with Blue Bird propane autogas buses, starting with the 2015-2016 school year. The school district, which purchased 86 Blue Bird Propane Vision school buses, hopes to convert more of their diesel fleet to propane buses in the future. Like many urban cities, Boston has implemented mandates for reducing tailpipe emissions. The school district, already the city’s largest user of diesel fuel, has enacted a number of emissions-reducing initiatives in the past 15 years through its “Greening Boston Public Schools” program. 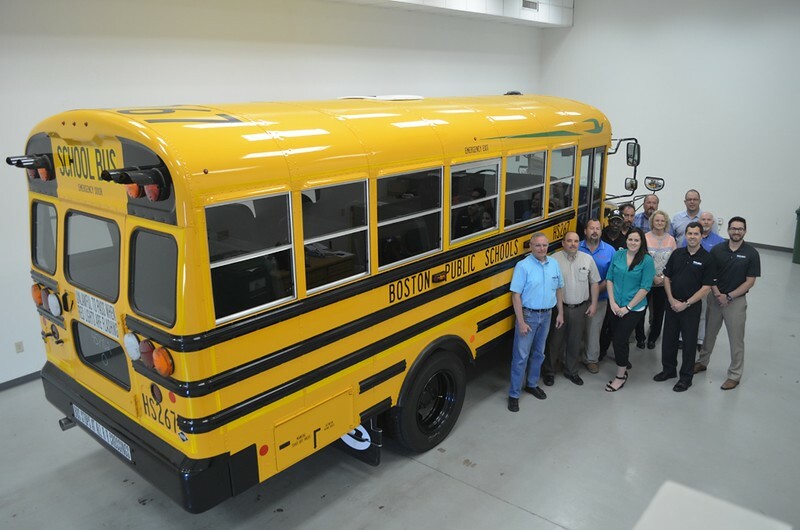 School buses fueled by propane autogas fit with their mission to choose vehicles with the highest efficiency and the lowest environmental emissions, according to Peter Crossan, fleet and compliance manager of Boston Public Schools. “These new Blue Bird Propane Visions mean many students will no longer be exposed to diesel fumes when boarding or disembarking our buses,” said Crossan. The new Ford V10-powered buses each come equipped with a ROUSH CleanTech propane autogas fuel system. The district’s autogas fleet will emit 66,000 fewer pounds of nitrogen oxide and 2,700 fewer pounds of particulate matter each year, when compared to the diesel buses they are replacing. Vehicles fueled by propane autogas emit 80 percent less smog-producing hydrocarbons and virtually eliminate particulate matter when compared to conventional diesel. Boston Public Schools started exploring alternative fuels once the city’s outdated tunnel restrictions were lifted. The school district expects to save at least $1 per gallon on fuel as well as lower maintenance costs due to the cleaner burning properties of propane autogas. To fuel the buses, Boston Public Schools has contracted with a company that performs on-site propane autogas fleet fueling services. “We want other school districts to know that on-site infrastructure isn’t the only option when introducing propane autogas into their fleet,” said Crossan. On Wednesday, the U.S. House of Representatives passed a highway and transportation funding bill that includes a provision meant to help level the playing field for how certain alternative fuels are taxed in relation to conventional fuels. H.R.3038, legislation to fund and extend the authorization for the country's highway and transit programs through the end of 2015, passed the House in a 312-119 vote. Find information about laws and incentives, fueling stations, vehicles, fuel prices, and more. Now you can kiss those futile hours spent goodbye, thanks to the revamped State Information pages on the Alternative Fuels Data Center (AFDC). Simply select which state you would like to find transportation data for, and you will be presented with information about laws and incentives, fueling stations, vehicles, fuel prices, and more—all in one easily accessible place. The AFDC's State pages aggregate many different sources of credible data (including the U.S. Energy Information Administration and R. L. Polk & Co.), and are a launching point for state-specific success stories presented through short videos and online case studies. The pages also allow you to quickly identify alternative transportation projects happening around the state, locate your nearest Clean Cities coalition, and find other reliable resources. Try it for yourself and get the scoop on your state now! The U.S. Department of Agriculture plans to spend $100 million on an initiative to double the number of higher-ethanol blend fuel pumps in the U.S. The Biofuels Infrastructure Partnership would provide grants to boost states' research into renewable fuel, including E15 and E85. However, economist Scott Irwin said the program may have little impact because the Environmental Protection Agency's recently announced ethanol mandates are too low to prompt changes from refiners and service stations. EPA published the proposed ozone National Ambient Air Quality Standard (NAAQS) in the Federal Register. This begins the comment period which closes on March 17th. Click here to view the proposed rule.